Pizza games for kids are fun as they involve pretend and play and children usually love pizzas. A group of children or a family can gather together to play a pizza game and spend an evening having a blast playing with pizza slices all while learning math. 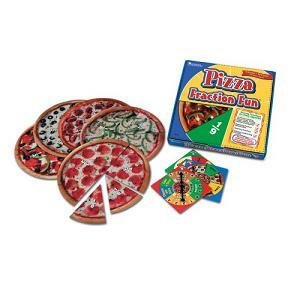 With pizza board games, kids pretend playing with a pizza and learn to count and add numbers. Some more advanced pizza games for older children even involve identifying and calculating fractions. There are two pizza board games that we recommend, one that is designed for younger children and that teaches basic math and another for older children that is more advanced and that teaches about fractions. The Pizza Math Learning Game by Trend Enterprises Inc is for younger children (for ages 4 and above). In this game, players win points everytime they create a pizza with numbers in the right order (by the way, detailed instructions on how to play are provided). This game teaches counting and adding numbers up to ten. It also teaches sorting and grouping numbers. Therefore, it requires children to have some critical thinking skills in order to play and win the game. We recommend this game before moving to more advanced pizza games. The Pizza Fraction Fun Game is more advanced (for ages 6-12). It is an award winning game which goes to show its educational value. Pizza Fraction is about identifying, matching and adding and subtracting fractions. This is actually something children learn at school when they reach the age of 8-9, therefore this game is great for learning fractions. Kids play 7 games which involve building pizzas with 13 pizzas (with one side of each pizza showing the fractions). For example, one game is about identifying fractions, another game is about finding a fraction less than or equal to 1. There is also a game about finding equivalent fractions and a game about adding and subtracting fractions. We like the fact that there are so many games as it make the game more fun to play and as it helps kids understand fractions really well. And we like the very realistic look of the pizza and the fact that the pizza slices are durable. The only drawback that we have found is that this game will make you really hungry for pizza especially considering the slices very realistic look!